Thousands of years ago, Japanese artisans had a habit of mixing maize weevils into their clay when making pottery. The recent discovery of a single pot packed with an estimated 500 weevils is adding to our knowledge of this practice, and the extent to which these destructive pests plagued ancient Japan. A Kumamoto University research team led by archaeologist Hiroki Obata has uncovered the extraordinary relic at the Tatesaki archaeological site on the Japanese island of Hokkaido. The incomplete pottery vessel dates back to the Late Jomon period, which thrived between 4,500 and 3,300 years ago. Using x-ray CT scans, Obata’s team counted 417 adult maize weevils embedded into the recovered pottery. By extrapolation, the complete, unbroken vessel likely contained around 501 weevils, according to the new study published this week in the Journal of Archaeological Science. Maize weevils, known as the greater rice weevil in the United States, are a major pest of maize and rice, hence the descriptive monikers. These pests are typically found in stored rice grains, but they’re also known to munch on stored reserves of wheat, oats, barley, and even some fruit. During the Jomon period, and prior to the introduction of rice farming, these weevils munched on stored acorns and chestnuts, which the ancient Japanese kept inside of storage huts known as pit houses. Maize weevils are not indigenous to Japan, likely arriving with Japanese ships from the Korean peninsula many thousands of years ago. That ancient Japanese artisans embedded maize weevils into their pottery is well established. But the new pot uncovered at Tatesaki contains an unprecedented number of maize weevils. The finding speaks to the kinds of food stored and consumed by the Jomon people and the extent to which these pests had spread throughout Japan. What’s more, the practice offers some insights into the spiritual beliefs of these people. By 2003, Jomon pottery with impressions of maize weevils had been discovered at multiple sites around Japan. Artisans used other insects, too, but maize weevils were a clear favourite, representing 90 per cent of all recorded impressions. In 2010, Obata found the earliest evidence of this practice in 10,000-year-old pottery uncovered on the southern Japanese island of Tanegashima. Two years later, Obata’s team found pottery fragments with weevils at the Sannai-Maruyama site in Aomori, a prefecture in northern Japan. This area experiences cold winters, forcing the pests to survive in warm indoor environments—further proof that weevils were infesting Jomon food stores and, quite possibly, were migrating north. In the latest development, Obata has uncovered the first maize weevil impressions in pottery found in Hokkaido. The large size of the weevils uncovered in this pottery suggests they subsisted off of chestnuts, and not acorns (chestnut-eating weevils are 20 per cent longer than the acorn-eating variety). 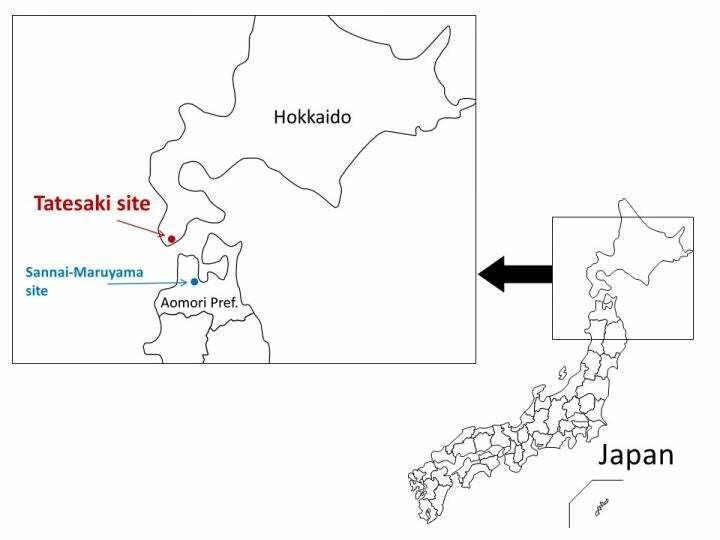 And because chestnuts are not native to Hokkaido, it’s potential evidence that the Jomon people brought this food, along with the weevil interlopers, to the Japanese northern island from the south using ships to cross the Tsugaru Strait—the channel separating the main Japanese island from Hokkaido. Why the Jomon people mixed maize weevils into their pottery is a mystery, but Obata has a theory. He believes that “the Jomon people mixed the weevils into the pottery clay with the hope of having a good harvest,” he said in a statement. Which makes sense. The literal integration of weevils with a storage container must have been a powerful image and gesture; where there are weevils there are ample amounts of food, and vice-versa.